Alexis Apartments are located in the old, picturesque part of Benitses village just 200-250 meters away from the main square, the beach and all shops, cafes, restaurants and markets. It is a small family business with wonderful views to the green mountains that promises its customers a good service and quiet relaxing holiday. All studios and apartments are modernly-furnished spacious rooms with separated kitchen, along with essential equipment needed. 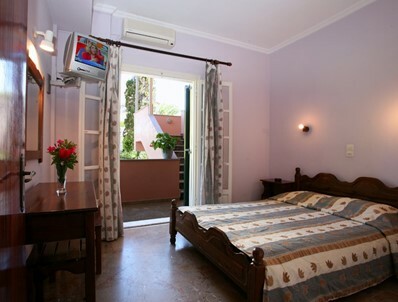 Air condition, TV and wireless internet access are also provided. A private parking area is located within 30 meters distance. The building consists of 3 floors. Each floor has 1 studio x2 beds (Studio Room / Couple), 1 studio x3 beds (Studio Room / 3 beds), 1 apt x4 beds (Small Apartment) and 1 apt x6 beds (Big Apartment). 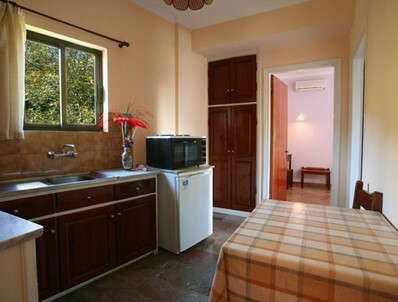 Kitchen is fully equipped with fridge, cooker with 2 electric rings and small oven, and all cutlery and crockery. Bathroom includes SH/WC and hair drier. 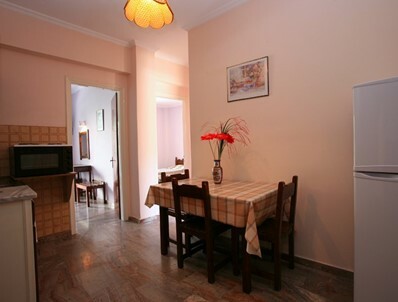 Every studio and apartment, is equipped with air condition and TV, as well as wireless internet access. Enjoy the green mountain view from your private balcony or verandah. It is a small family business that promises its costumers a good service and a quiet relaxing holiday. This Room Type can accommodate up to 3 people. Choose to stay in our comfortable small apartments, that can accommodate up to 4 people. Our suggestion to the Couples. A comfortable stay in our beautiful large apartments, which can accommodate up to 6 people. Room Cleaning Service: Every 2nd day.